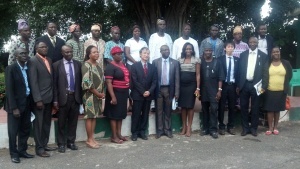 On Tuesday, 4th of November, 2014 at the Office of the Governor of Ogun State, the Executive Director of KIND, Mrs. Amy Oyekunle and the Ambassador of Japan to Nigeria, H.E. 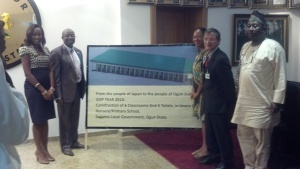 Mr. Ryuichi Shoji, signed the Japanese Grant Assistance for Grassroots Human Security Projects (GGP) for the construction of a Block of 6 Classrooms with 4 Toilets, Provision of 138 sets of desks and chairs for the students, and 7 tables and 8 chairs for the teachers. This event had in attendance the Governor of Ogun State, H.E. Senator Ibikunle Amosun, ably represented by his Chief of Staff, Prof. Ganiyu Olatunde, Japanese Ambassador to Nigeria, H.E. Mr. Ryuichi Shoji, The Commissioner of Education of Ogun State, Barr. Segun Odubela, The Special Adviser to the Governor of Ogun State on MDG, Mrs. Hafsat Abiola-Costello, The Permanent Secretary Ministry of Education, The Executive Director of Kudirat Initiative for Democracy, Mrs. Amy Oyekunle, The Vice Chairman of Sagamu LG, amongst others. “Good Afternoon, Your Excellency, The Governor of Ogun State Senator Ibikunle Amosun, H.E. Ambassador Ryuichi Shoji, the Ambassador of Japan and representatives from the Japanese embassy, gentlemen of the Press, permit me to stand on existing protocol. On behalf of the board and staff of KIND, I welcome and thank you for making time to attend this contract signing ceremony between the Embassy of Japan’s Grant Assistance for Grassroots Human Security Project (GGP) and the Kudirat Initiative for Democracy (KIND) for the construction of a 6 – Block Classroom/toilets for the Imoro-Ogijo Community Nursery and Primary School located in Sagamu LG in Ogun State. KIND applied for the GGP grant in late February and out of 200 proposals across Nigeria, our proposal for the construction of 6 blocks of classroom in Imoro Community Nursery/Primary School in Sagamu LGA of Ogun State was selected in July. 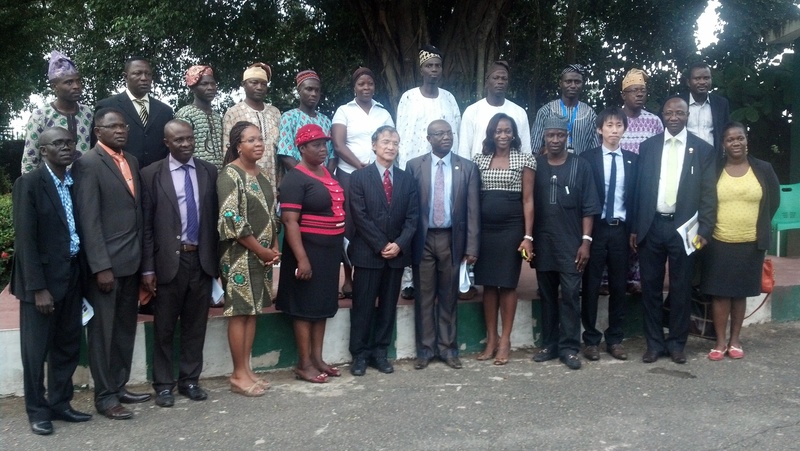 We are extremely excited about the prospect of working with the embassy of Japan and the opportunity to further strengthening our relationship with the Ogun State government, Office of the Special Adviser on MDG’s, Sagamu LG and other bodies involved. We have had a long and fruitful relationship with Ogun State as a whole and Sagamu in particular. In 2012, Sagamu was one of the 8 local government areas selected to work with on the “Bridging the gap between government and citizens empowerment through engagement” a project funded by the social development civil society fund of the World Bank and Open Society for West Africa (OSIWA). Through this project, KIND trained local government personnel on community engagement and social accountability and facilitated platforms of engagement for community members and local government. KIND also worked extensively with youths of Ogun State on Youth Entrepreneurship and Leadership programme called YouthTrade – an initiative to complement the efforts of government to address youth unemployment and create sustainable jobs. Our work has allowed us to become intimately conversant on the needs of the community thus prompting our submission of a proposal for grants assistance for grassroots human security project (GGP) to the Embassy of Japan. We are convinced that this, like our other projects will strengthen individuals, organizations, communities and eventually our thriving democracy. Good afternoon. 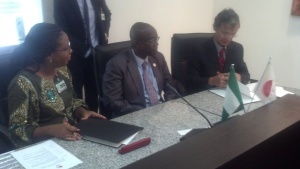 I am most grateful to all of you for attending today’s signing ceremony. I would also like to express my deepest gratitude to His Excellency Senator Ibikunle Amosun, Executive Governor of the State, for being here with us to witness this auspicious occasion. Today, we are having the signing ceremony for “The Project for the Construction of Local Government Education Authority Imoro Community Nursery/Primary School in Sagamu Local Government Area in Ogun State”. 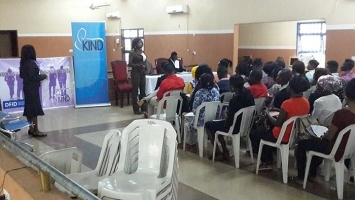 The project is designed in response to the request from Kudirat Initiative for Democracy, which was founded by Mrs. Hafsat Abiola-Costello, Special Adviser to the Ogun State Governor. At the Imoro Community Nursery/Primary School, pupils are studying in congested classrooms with many in classrooms which are still under construction. Through the project, 1 block of 6 classrooms and 4 toilets, 138 sets of chairs and tables for the pupils, 7 tables and 8 chairs for teachers will be provided. Ladies and Gentlemen, each time I visit Ogun State I feel the state moving forward. The dynamism which is transforming Nigeria is tangible here. Given the current economic situation in Nigeria, we believe that growth led by the private sector should be given the driving seat in Nigeria’s economic development. 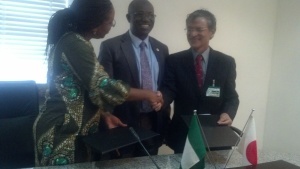 Mindful of this, the Federal Government, States and Japan as development partner, are collaborating their efforts to improve the hard and soft infrastructure and create a better environment for the business sector. With regards to creating a business friendly environment, Ogun State is a case in point, as attested to by the recent ‘Doing Business in Nigeria’ report, prepared by the World Bank. Yes, growth is important, but growth should be inclusive. Everybody is to be made to participate in and benefit from growth. That’s why we need to make extra efforts to provide decent opportunities for children, boys and girls, to be able to fully explore their potentials. 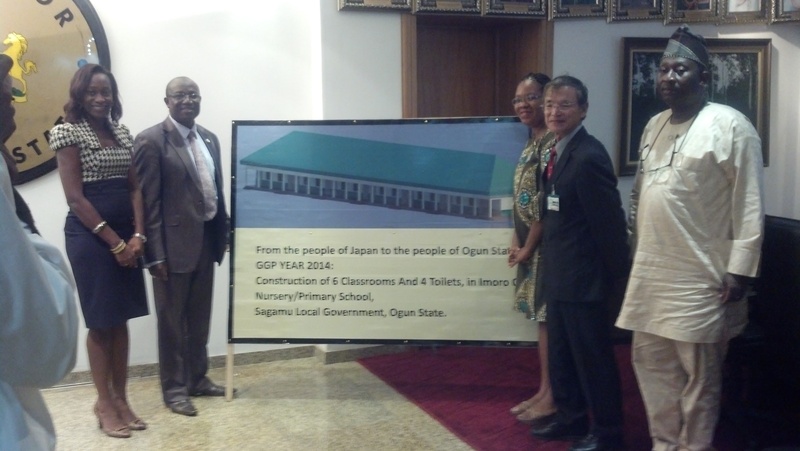 I happily take note that the Ogun State Government has been serious in providing better education for children. One of the notable policies set by Ogun State, as I understand, is “Affordable Qualitative Education” which includes promoting free education, improving the quality of teachers, renovating dilapidated classrooms and constructing new classrooms blocks. The policy is in line with a legacy of Chief Obafemi Awolowo, who struggled to receive education in his childhood due to financial problems. Chief Awolow’s legacy coincides with the belief we Japanese hold. Whe Japan opened up its doors to the Western world, one of the first things it did was to ensure that every boy and girl was going to school. 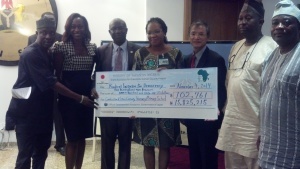 These efforts should be sustained and accelerated in Nigeria. I believe that the project we are going to sign will be a modest but important contribution to support what the Ogun State Government is doing in this regards. The private screening of Prof. Ali Mazrui’s “The Africans” at KINDs office on Saturday, 1st of November 2014, was an opportunity for those present to reminisce on the history of Africa, her rich culture and the effect of western influence on her societal systems. The documentary focused on the need to promote African language, mode of dressing, architecture and lifestyle, law and justice, and the definition of corruption with regards to African culture. According to Prof. Ali Mazrui, the use of indigenous languages helps to effectively transfer knowledge of both religion and education and should be promoted, even in this ever-growing global village. From the documentary, the unique blend of westernization with indigenous culture was not affected by religion, as otherwise thought by most historians. For instance, the ancient symbol of the Sun in Egypt has become a symbol also in the Islamic faith, the Crescent. But despite this blend between indigenous African culture and outside influence, African lifestyle especially with regards to dressing, has undergone little change due to the climate of the region that has also kept most of the monuments of African civilization in that region intact through time. 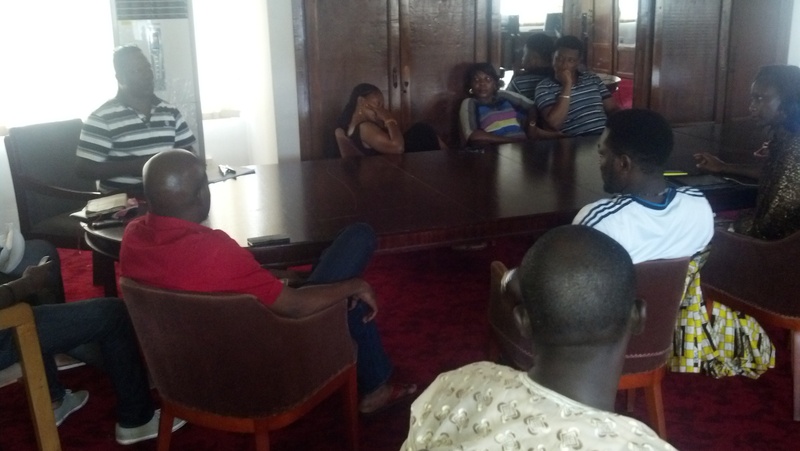 “The Africans” which is a five series documentary would be further screened at KINDs office, in the coming weeks. Our goal is to promote the understanding of African history as a means to planning for our future, the promotion of indigenous culture and traditions especially in the 21st century, and the documentation of our past for the generations unborn. Watch out for the next screening! The Premiere of The Supreme Price brought personalities from various works of life to the Light, Camera, Africa!!! 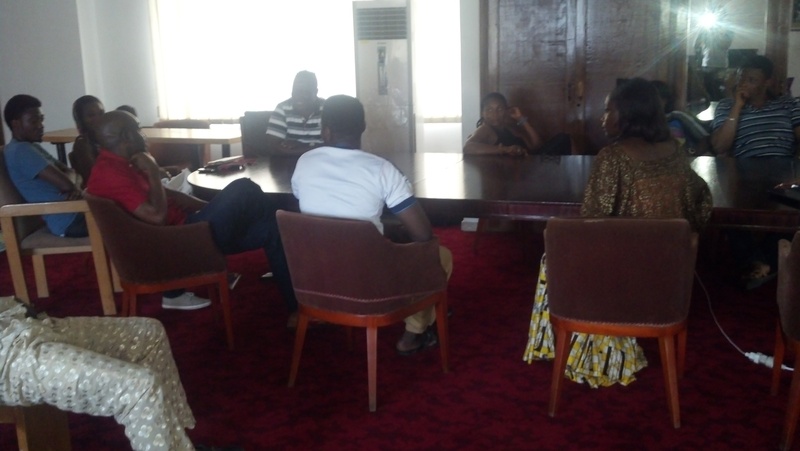 Film Festival that took place at the Federal Palace Hotel from the 25th of September to 1st of October, 2014. The Supreme Price which premiered on the 27th of September saw a fully packed hall of enthusiast who wanted to re-live the events of the death of Alhaja Kudirat Abiola,Bashorun MKO Abiola and the activists that struggled for the democracy we enjoy today. The premiere saw the presence of various dignitaries such as Mrs. Hafsat Abiola-Costello, her brothers Mr. Lekan Abiola, Mr. Jamiu Abiola and Mr. Abdul Abiola, their wives and several other family members. Also present at the premiere was the Co-Producer of the documentary, Mr. Tunde Kilani, Mr. Makin Soyinka, Mrs. Pamela Braide, and many others. 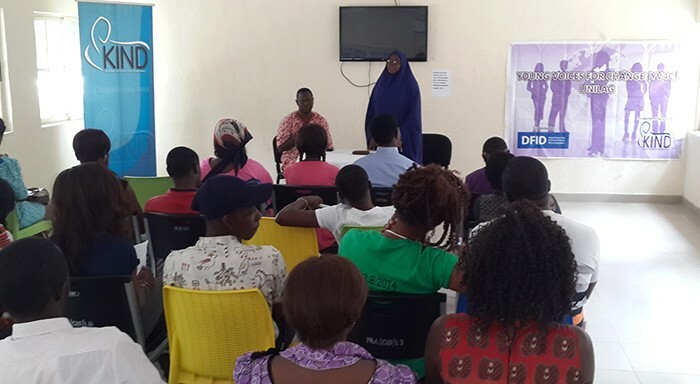 The Young Voices for Change (YV4C) programme kicked-off with a programme launch in the Lagos State Polytechnic (LASPOTECH) and the University of Lagos (UNILAG) on Thursday 21st and Friday 22nd August, 2014 respectively. 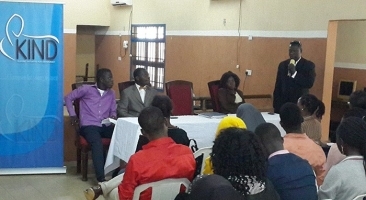 In attendance at both programme launches were the training participants, representatives of the student union body, representatives of Deans of Student Affairs and the KIND team. 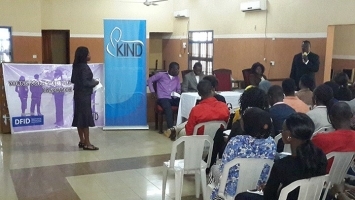 The KIND team was led by Mr. Owonifari, KIND’s head of Finance and Administration, who was representing the Executive Director of KIND, Amy Oyekunle. The ‘Safe Space Training’ has since started in both schools. The Supreme Price is a feature length documentary film that traces the evolution of the Pro-Democracy Movement in Nigeria and efforts to increase the participation of women in leadership roles. Following the annulment of her father’s victory in Nigeria’s Presidential Election and her mother’s assassination by agents of the military dictatorship, Hafsat Abiola faces the challenge of transforming a corrupt culture of governance into a democracy capable of serving Nigeria’s most marginalized population: women. The documentary was produced and directed by Joanna Lipper. Joanna is an award-winning filmmaker, photographer and author of the nationally acclaimed book, Growing Up Fast. As a Lecturer at Harvard University, she teaches Using Film For Social Change. Her work as a documentary filmmaker has been supported by the MacArthur Foundation, Ford Foundation/Just Films, ITVS, the Gucci Tribeca Documentary Fund, Chicken & Egg Pictures, Women Make Movies, IFP Spotlighting Documentaries, and Britdoc Foundation.